Weaving Within My Lane In Colorado – 42-4-1007 – Can They Stop Me For Suspected DUI? Although you would not know it if you talk to a DA or police officer – here it is -WEAVING WITHIN YOUR LANE IS NOT ILLEGAL – If you do NOT cross any lines there is no violation of Colorado’s traffic code. If your car is stopped for ONLY that reason – it is an illegal stop and should be challenged as unconstitutional in court. What If I Weave Within My Lane and Weave Outside Only One Time? Since Colorado’s weaving law is somewhat vague – (it requires you to drive as nearly as is practicable within a single lane) a single weave may not be enough to stop your vehicle legally. That is – one weave outside your lane is probably insufficient evidence for a traffic violation to base a constitutional stop. Such a stop must be based on “reasonable suspicion” such that there must exist “articulable facts” beyond a mere hunch or a guess. If a vehicle is stopped for a violation of a law, the police must be right about their interpretation of the law and have specific facts – and evidence – that they must identify in court. Weaving Plus Difficult Driving Conditions – Grounds To Make The Stop? A Colorado criminal defense lawyer – defending a DUI case where weaving is the reason used by the police to make a stop of suspected driving under the influence, will look for evidence in the case indicating difficult driving conditions or other kinds of adverse weather that might explain driving errors. An example of an illegal stop might me a single instance of a vehicle moving into an emergency lane on a mountain road in windy conditions. One case has held that this does NOT raise a reasonable suspicion of violating the weaving statute. It has been held that the DUI investigation is searching for the nebulous “indication of impairment.” While it is clear that weaving alone is not necessarily indicative of impairment, when it is combined with failing to remain in a single lane and the lack of adverse driving conditions MAY BE indicative of impairment according to the courts. When Do Ordinary Driving Errors Mean Reasonable Suspicion To Stop A Car For A Traffic Violation? What Does Reasonable Suspicion For The Stop Mean In This Context? An “investigatory stop” is justified at its inception ONLY if there exist specific and articulable facts and rational inferences drawn from those facts that give rise to a reasonable suspicion a person has or is committing a crime. The Court reviews whether reasonable suspicion to justify the stop by reviewing the “totality of circumstances” to determine whether reasonable suspicion existed at the time of the stop. This analysis requires an “objective inquiry” and NOT the police officer’s subjective motivation for the stop. The officers subjective motivation for making the stop can play no role in reasonable suspicion (Fourth Amendment) analysis. The courts will defer to “reasonable inferences” of law enforcement officers during the analysis and a police officer’s reasonable mistake of fact may be used to support a finding of reasonable suspicion. However – as in the weaving statute – if there is a “mistake of law” – it will NOT support a finding of reasonable suspicion. An investigative detention must be based on reasonable suspicion of criminal activity. Question One – Was even a seizure by the officer? Question Two – Was the seizure was supported by adequate reasonable suspicion? (An officer may stop a person when the officer has reasonable suspicion to believe that the person has committed or is committing or is attempting to commit a crime.) Reasonable suspicion is substantially less than probable cause and considerably less than proof of wrongdoing by preponderance of evidence. So Once Again – What Creates Reasonable Suspicion? Reasonable suspicion will usually arise from a number of related factors and even if each fact appears to have an innocent and legitimate explanation, the Colorado courts look at the “totality of the circumstances” and this includes a police officer’s training and experience. It is important to quickly note – (and most people do NOT fully understand this legal nicety) – even if a fact or event has an innocent explanation – this does not necessarily defeat a conclusion of reasonable suspicion. Any traffic violation, no matter how insignificant it is – whether it is a moving violation or a non-moving violation, will justify a traffic stop. For example equipment violations may justify a stop – these include license tag light out, a license plate that is obscured or is not visible from a reasonably safe distance. Weaving within the lane may support a stop if it happens multiple times and there is no other reason explaining the weaving – such as heavy and sustained winds. But if the weaving is not significant, and there is no other violation of the law, there is usually insufficient reasonable suspicion for a stop. ABOUT THE AUTHOR: H. Michael Steinberg – Email The Author at hmsteinberg@hotmail.com – A Denver Colorado DUI Criminal Defense Lawyer – or call his office at 303-627-7777 during business hours – or call his cell if you cannot wait and need his immediate assistance – 720-220-2277. 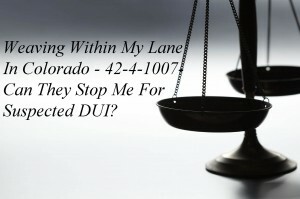 If you are charged with A Colorado crime or you have questions about the topic of this article – Weaving Within My Lane In Colorado – 42-4-1007- Can They Stop Me For Suspected DUI?, please call our office. The Law Offices of H. Michael Steinberg, in Denver, Colorado, provide criminal defense clients with effective, efficient, intelligent and strong legal advocacy. We can educate you and help you navigate the stressful and complex legal process related to your criminal defense issue.